I’m not too pleased with what I see on their website, though, and what I know about their organization. I don’t like this trend of commercializing issues, like pink bracelets, shoes, blenders, shirts, dishes, cheese graters, socks, etc., for breast cancer. It’s great that you want to give to an organization, it really is. But must you get something in return? Why can’t we just give to do something nice, to support a cause we supposedly care about? We don’t need to receive a shirt or a bracelet in return so that we can wear it around and say, “I care that some women get breast cancer,” or “I care that some kids get depressed.” Where’s the humility in all that? Don’t you feel more aware of the issues I and other depressed people face now? And, bonus points, because these kiddos and their Magic Markers get to feel like they actually did something non-selfish for once. But not really. 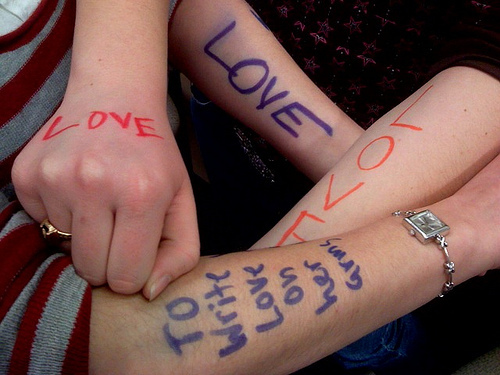 What this does is draw attention to THEM, the the words on their arms. It doesn’t blatantly have anything to do with depression, just like a Facebook status about my bra or my purse has nothing to do with breast cancer. I don’t look at this and feel that people care about my problems. I don’t see a bunch of people who would like to hear about my depression, who would listen without feeling uncomfortable if I told them about the times I was on the ledge. I look at this and see a bunch of people who want to feel like they did something charitable, but don’t want to put time, effort, or money into it. I look at this and see a bunch of kids who probably enjoy the attention they get for having scribblings on their arms for a day. Sure, I’m making assumptions about these people. But they’re not doing anything blatantly proactive, and I’m mad. I’m not even asking that they give money. We’re all poor, I get it. I’m not asking that they volunteer at a youth shelter or even hand out pamphlets on the sidewalk. But we can do so much more than write a word on our forearms. Why don’t you look at your own social life and the way you treat people? How can you know that the girl you ignored in class today doesn’t have depression? How can you be sure that the clumsy boy you laughed at in the hall isn’t suicidal? If you must make these issues about yourself, then turn a critical eye on your interpersonal relationships and social interactions. Reach out to a lonely person, and try not to act like you’re a saint for doing it. Reprimand a friend if they tease someone. Listen to your friend’s problems. Put a stop to meanness, in general. Be kind and respectful. Don’t stop at writing a word on your arm, or a Facebook status about bras. Go one step further to say you actually care. The commercialisation of philanthropy, as you put it, is something I see as an “ends justify the means” kind of thing. I mean, people who’d donate will donate anyway, and if they can raise additional funds via merchandising, why not? Hell, all charitable organisations could use more money, and 9 times out of 10, the people buying this merchandise would spend this money somewhere anyway, so why not give them an incentive to donate, right? Yes, they don’t truly care, but the truth is, they never cared. It’s just that never caring used to mean never donating as well. This way, money comes in even if care doesn’t. As to the so-called awareness campaigns run by facebook, I’m still not entirely sure how they work. We all know breast cancer and depression exist and are serious problems. I’m not exactly being hit with a revelation on how deadly breast cancer is when I discover that my coworker wears a green bra. So what is their purpose, exactly? I mean, what’s the end goal, what’s considered a success for these campaigns? Until I can figure them out (and most likely after that too) I’m in full agreement with you. The real issue with the commercialization of things like that, especially with breast cancer, is that you can’t be entirely sure that the profits will actually go to any sort of breast cancer foundation. It’s become that much of a fad to make things “pink” for breast cancer, that companies can probably count on selling things just because they supposedly benefit breast cancer. But we don’t know if it’s legit. Sure, it’s not a perfect world, but I think people should ask themselves why they need attention when they give to charity, or why they need to get something in return. Because giving 100% to a charity is better than giving 10% to a charity, and 90% to a t-shirt company so you can have something that says, “I support breast cancer research,” or what have you. If you really supported it, you’d give 100%. I’m surprised you haven’t heard about it until now…they’ve done tons of events on campus for it. But well said, nevertheless. It’s just like the “turn your profile pic into a cartoon from your childhood to bring awareness to child abuse….” thing going on on FB right now. Umm not sure what “awareness” is going to do when a kid gets beaten in the privacy of his home. Unfortunately, most people don’t care about an issue unless or until it affects them personally in some way. I’ve heard of it before, but it was recently, like last year, when I first heard of it. I think it’s a pandemic. People are into this whole “slacktivism” thing, so they can pretend they’re making a difference by doing something so mind-boggingly easy. It just eases their guilt, but has no real effect. I think the merchandise is good. I might never have known of TWLOHA had I not seen someone with a shirt that had ‘To Write Love On Her Arm” written across it. Seeing the shirt motivated me to Google it and learn more about it. While some will buy the stuff simply to show off that they “care” I like to believe most get the items to make others aware that the organization exists. I really appreciate your perspective. I was a part of the community that helped launch TWLOHA in Orlando. Being a freegan myself, thereby incredibly wary of consumerism/commercialism in general, I have also had my moments of skepticism and reticence over the years. I was always surrounded by those t-shirts and wondered where the money was going and what good they were REALLY doing. I never bought their merchandise myself, mostly for lack of funds, but I did/do support the organization in those less tangible ways – I really do care (never felt the need to wear their slogan accross my chest to advertise it). That being said, I don’t think there’s any reason to assume that the folks wearing these shirts are not also doing the things you described in your last paragraph. One can only hope that the t-shirts really are serving their intended purpose. Perhaps more important, I would think, is whether the money is being spent wisely. I didn’t know them personally, but I was only one degree of separation away from the folks who run TWLOHA. They seem to be pretty legit – after following them for several years, I have seen a lot of the good that they have accomplished in the lives of depressed, suicidal, and addicted kids. Thanks again for your post. And for caring. Thank you for your comment and the information on the organization. I don’t mean to underestimate the important task that is raising awareness for an issue. It was more an opportunity for me to wonder at why it is that modern American society has to have some sort of motivation for doing good deeds, whether they get a product or attention in return. 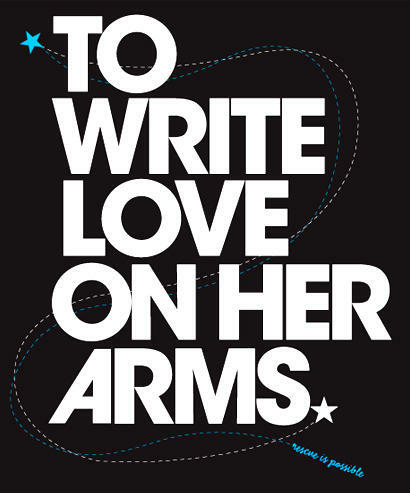 But I suppose if a TWLOHA shirt ever saved just one life, then the whole thing is definitely worth it.